Enjoy watching our hard-working Middle School and High School actors during a wonderful show on April 21 (7–9 p.m.) or April 22 (3–5 p.m. or 7–9 p.m.) at the Hemsley Theater at UW-Madison. Each show is limited to 130 seats, and tickets must be ordered in advance. Peter and the Starcatcher is an imaginative, swashbuckling, and rollicking prequel to J.M. Barrie’s Peter Pan. The show won 5 Tony awards and ran on Broadway for 2 years. It involves ingenious stagecraft, imaginative storytelling, and the spirit of adventure. 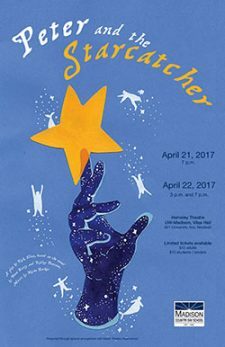 This student-focused production is designed and created by the students, focusing on the themes of Friendship, Imagination, and Leadership.